Last week was quite a week! On Monday, I couldn’t settle (because of what I knew was happening later in the week, as you’ll see) so I went for a run. It was supposed to be my normal 5k/3miles, but I found myself running on. The weather was gorgeous and I knew I wasn’t achieving anything at my desk so I thought, why not? I’ve run further before but 5 miles was the most, and I thought I’d do that again. I got to the point where I should have turned round and just…didn’t. I ran to the next village, when I could have turned back, but…didn’t. And the next. Still no turning back. To cut an hour and a half long story short, I ran an 8 mile circuit. EIGHT MILES! Me! You may remember that I only started running this year so it’s really a new me. Wednesday was the day I was nervous about. I’d been told I had won an amazing award. You’re probably wondering why someone would be nervous about knowing they’re winning an award. Thing is, SPEECH. You might be wondering why someone who does public speaking around 100 times a year would be nervous about making a short speech but the thing I was really nervous about was that I might accidentally pull the wrong speech out of my handbag, as the following day I was heading off for my daughter’s wedding weekend, at which I’d be proposing a toast at the pre-wedding dinner and then doing a reading (which I’d written) at the ceremony. Wahhhh! So, as you’ll imagine, I had a lot on my mind when my award was announced and I walked up to receive it and make the (correct, as it turned out) speech. I haven’t really got over how proud and grateful I am to have received it! Information books – or non-fiction, or factual books or true books, or whatever you want to call them – are the poor relation in the children’s book world. Though not in the adult book world, weirdly. There are far fewer awards, less name recognition, less respect from many people. The prizes – such as the Carnegie – which theoretically do allow non-fiction to be nominated, never include them. The World Book Day 2019 selection is better than last year’s grotesquely narrow and celebrity-focused range but it still fails to cover information books or poetry. But, if we are to create and inspire readers, we must include and celebrate all types of books, because all books, whether they have information or imagination at core, are based on truths about world. 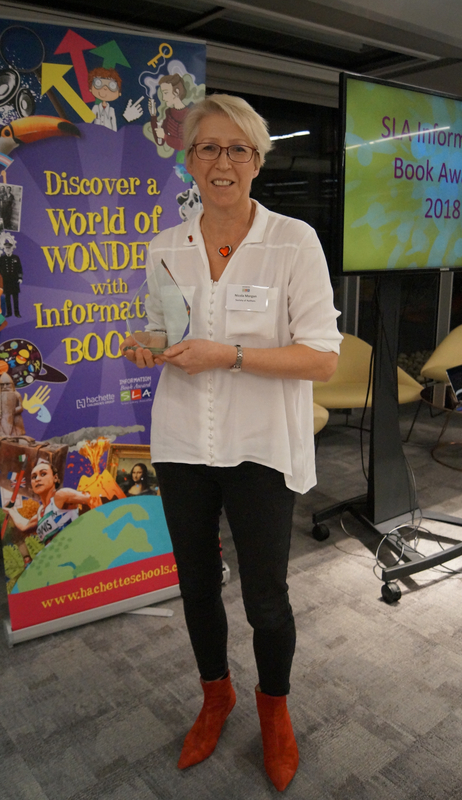 The awards earlier in the evening celebrated book on so many truths: War, Dinosaurs, Food, Sexuality, Disability, Science, Nature and the Supernatural, and Wolves. Who doesn’t love a book about wolves? I think pretty much any book is improved by the addition of a few judicious wolves! There were books to read aloud, books to make you cry, books with activities, a graphic novel to engage eyes and emotions, books to engage fingers, books with fantastic illustrations and books with fabulous words. rmation” writers and illustrators: we’re book writers and illustrators. We have subjects that fascinate and inspire us, we do our research and then we put the right lines in the right order on the page and polish till they shine. Then our editors do some more polishing and designers and production people work their magic and hey presto! A beautiful book is born for booksellers and librarians and parents and others to press into the hand of a child. When we all do it right, we inspire new readers and build understanding of world and each other; and the world becomes better place. Each good book, of fiction or information, has the power to do that. The School Library Association totally understands the value of non-fiction books. Librarians do, too. 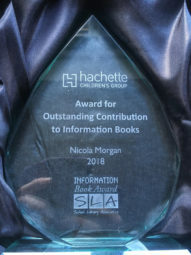 So does Hachette Children’s Group, who sponsor this award. I’m very grateful to all of them for the work they do. Without them, countless children wouldn’t find the enormous pleasure and benefit that comes from being a confident, proud reader. And I’m hugely grateful to Franklin Watts, who published Positively Teenage and are publishing Body Brilliant next year (and watch this space for news of a new contract soon!) and to Walker Books, publishers of Blame My Brain, and the Teenage Guides to Stress, Friends and Life Online. 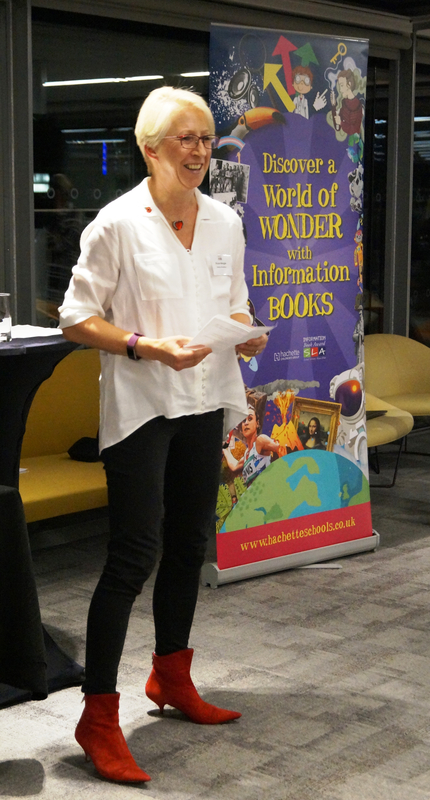 I write the books but there’s more to publishing than the bits I do – we need each other! But I’m mostly grateful to school librarians. They are the ones who most often put my books in front of the young people who need them. Sometimes people outside the children’s book world ask, “But do teenagers read your books?” Oh yes, trust me: they do. Thank you, librarians and teachers and parents, for all the lovely comments on Twitter and elsewhere, showing me just how many young people read and need and value the books I write to help them. Oh, and then, the day after the perfect wedding, it was my birthday. Quite a week!